An air-conditioned open plan living area. Fully furnished, 42” digital flat screen TV, DVD player and Micro music system. Gives access to the furnished balcony which overlooks the pool. American style open plan dining/kitchen fully equipped with all crockery, utensils, gas hob, electric fan oven, microwave, fridge freezer, toaster, kettle & water cooler. Dining table and chairs can seat up to 8. A large air-conditioned double room with a double bed, dressing table, fully fitted wardrobes and bedside cabinets. Has access to the balcony which overlooks the pool and gardens. A large air-conditioned twin bedroom with fully fitted wardrobes and bedside cabinets. Has access to the balcony which overlooks the pool and gardens. An air-conditioned bunk room with full size beds, wardrobe, chest of drawers & bedside cabinet. Walk in shower cubicle, toilet/bidet & sink with illuminated vanity mirror. Jacuzzi bath, with over bath shower, toilet/bidet & sink with illuminated vanity mirror. Beautiful well maintained landscaped gardens with a wide variety of Mediterranean plants. There is also seating area with large BBQ, table and chairs to seat 8 for al fresco dining in the garden. A view of the pool and gardens can be seen from the lounge and upstairs balconies. 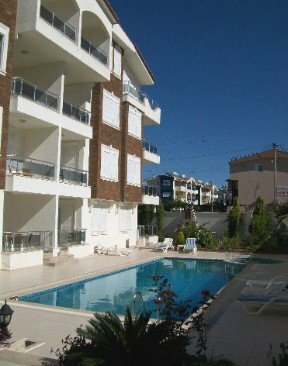 The complex has a good sized pool with separate children’s pool, sun beds & umbrellas. The apartment also benefits from a selection of music cd's, dvd's, books, Internet. There is also a washing machine, clothes airer, iron & ironing board. All bed linen & towels and are provided. 19 litre drums of water for the water cooler can be purchased from the nearby market which is close to the apartment & they will deliver them to your door if you require.